Strong winds and snow in some areas of the state on Saturday left thousands of Mainers without power Sunday morning. Shown here is a downed wire from a powerful thunderstorm on Sept. 6 that left more than 25,000 CMP customers without power. Maine’s first nor’easter of the season buffeted the state Saturday with rain, snow and high winds that left thousands without power. Nearly 709 Emera Maine customers where still without power as of 4 p.m. Sunday, most of which were concentrated in the Millinocket area and scattered locations along the coast in Hancock and Washington counties. That was down from more than 6,850 early Sunday morning. “Emera Maine crews have safely restored service to several thousand customers after strong winds blew through Washington, Hancock and Penobscot counties overnight Saturday into Sunday,” Emera Maine spokeswoman Judy Long said in a statement. “Crews are working to address all remaining outages, including those affecting island customers, before the end of the day. “All customers able to receive power should expect service restoration by 10 p.m.,” Long said. Some 1,463 Central Maine Power customers were without power at 5 p.m. Sunday, primarily in Oxford County. 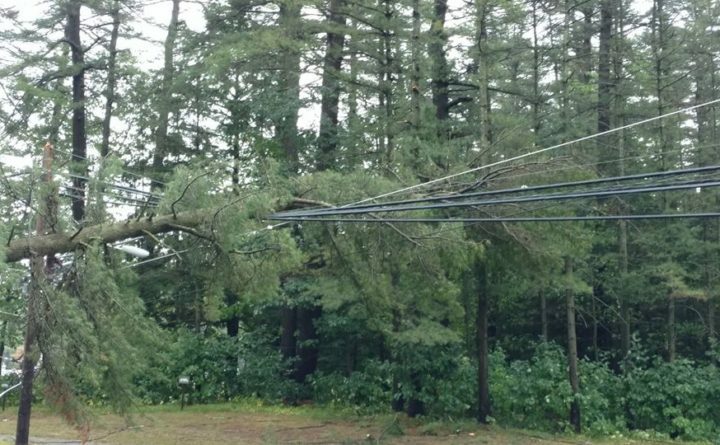 Outages in CMP’s service area reached a high of more than 13,000 on Saturday night. Across southern and western Maine, winds reached speeds between 26 and 56 mph, with gusts hitting 44 mph at Knox County Regional Airport in Owls Head and 56 mph in South Bristol, according to the National Weather Service’s Gray office. Farther up the coast, just west of Bar Harbor saw gusts up to 53 mph, according to the weather service’s Caribou office. While western and interior Maine saw light snow accumulation, heavier snowfall was recorded in Bethel and Fort Kent, which each received 3½ inches, according to the weather service. A small craft advisory remains in effect along the coast until midnight. But don’t worry about shovels, as the snow is expected to melt in most areas. Nikki Becker, a meteorologist at the weather service’s Gray office, said Sunday’s highs should hit the low 50s along the coast, the upper 40s in central Maine and the low 40s in the foothills. Tuesday should be the best day of the week, as skies are expected to be clear, she said, adding there is a chance of showers on Halloween, but the rain will start mostly overnight in the mountains and foothills.